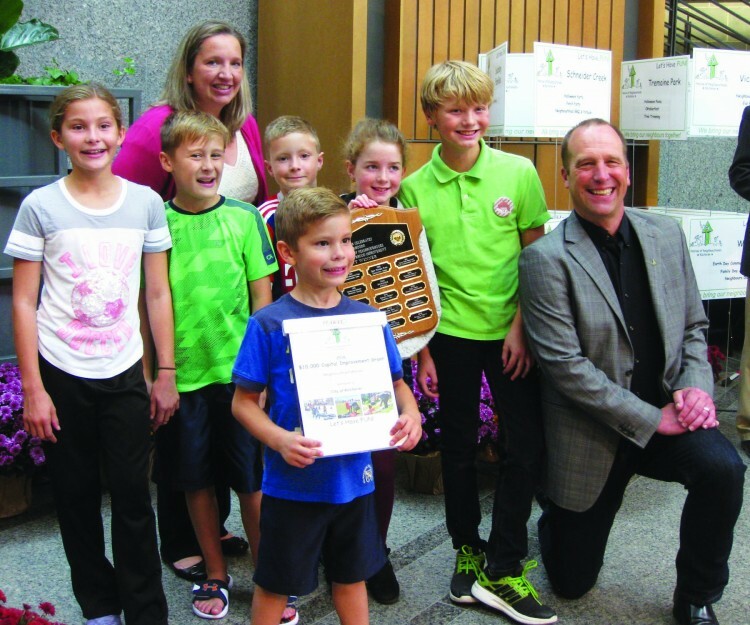 Kitchener’s Hohner Estates neighbourhood was the winner of the Festival of Neighbourhood’s $20,000 capital grant. From left: Councillor Kelly Galloway-Sealock (Ward 5), neighbourhood representatives Jessie Eulenberg and Nadia Ursacki, Councillor Sarah Marsh (Ward 10). A large crowd gathered at Kitchener City Hall to celebrate Kitchener’s strong and thriving neighbourhoods at the 23rd annual Festival of Neighbourhoods (FON) Finale on October 16. During the past year, more than 24,100 Kitchener citizens took part in 170 registered Festival of Neighbourhoods events. Those events were organized or lead by more than 1,685 neighbours. The Festival of Neighbourhoods is all about inclusion. It was built on the premise that neighbouthood happens face to face and that building friendships and good relationships among neighbours is an important part of creating a resilient community. Getting to know the people who live around you makes the community safer, one where people look out for each other. Neighbourhood activities allow these relationships to develop and grow and may even spawn creative ventures that enhance the neighbourhood such as improving parks, completing neighbourhood clean ups or creating new spaces for people to gather. Initiated in 1994 by the City of Kitchener, the Social Development Centre Waterloo Region and John MacDonald Architect, the festival continues to grow each year. Over the years activities have included neighbourhood BBQ potlucks, plants and book exchanges, nature and history walks, clean-ups, planting trees, showing outdoor movies, fun fairs, tobogganing or skating parties and street parties. Each year, the Festival of Neighbourhoods gathers to recognize the people who have made a difference in their neighbourhoods. The highlight is the awarding of two capital grants from the City of Kitchener, one for $20,000 and one for $10,000. Every neighbourhood that registered an event in the past year has a chance to win one of the two awards. The names of all registered neighbourhood events are placed into a draw for the two grand prizes. ​The grant money may be used to fund an event or a capital project in their neighbourhood. 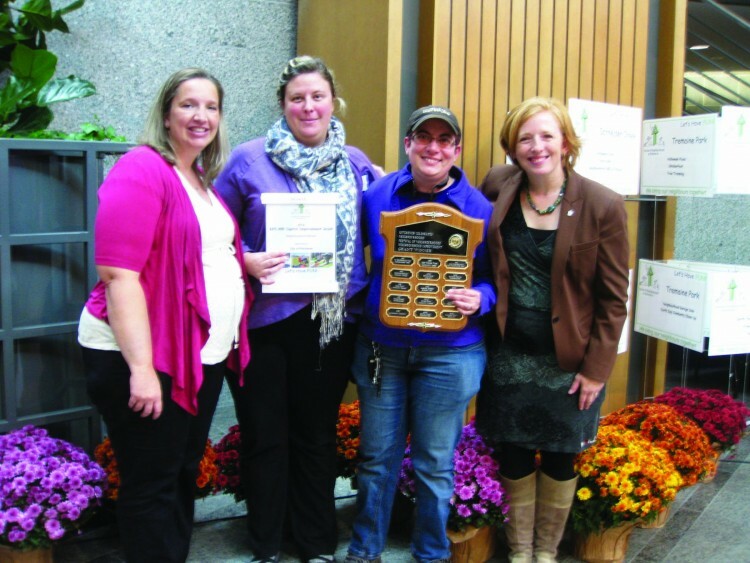 The Festival of Neighbourhoods also presented awards in numerous other categories. ​Ward Challenge winner - Ward 10 (represented by councillor Sarah Marsh) with 38 registered activities. Neighbourhood Connections Award - Cherry Park Neighbourhood, for its engagement and community development activities to strengthen the social connections in this neighbourhood (this is the second year in a row that this neighbourhood has received this award). The 2016 FON is sponsored by: Alejandra Ivic , RE/MAX Twin City Realty Inc., Grand Valley Society of Architects, Hammond Plumbing & Heating, Independent Living Centre of Waterloo Region, Swanson’s Home Hardware Building Centre, Victoria Park Neighbourhood Association, Waterloo Regional Police Services, WSP/MMM Group. Representatives from the Edgewater Estates neighbouhood in Kitchener accepted the $10,000 FON capital grant draw prize from (far right) Kitchener councillor Dave Schneider (Ward 2) and Kitchener councillor Kelly Galloway-Sealock (back). From left: front, Ben Renner, middle, Ashlynn Renner, Dylan Renner, Ben Nicholls, Taylor Robinson, Colin Robinson. 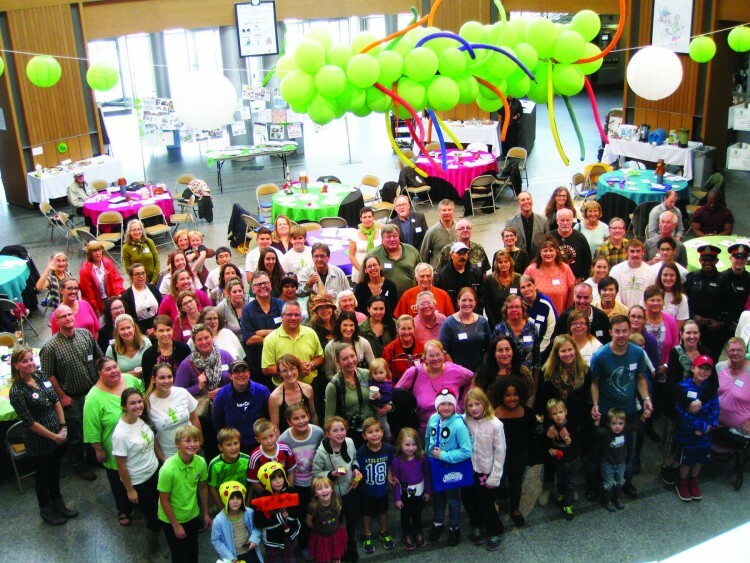 Representatives from many of Kitchener’s neighbourhoods gathered to celebrate at the Festival of Neighbourhoods Finale held at Kitchener City Hall October 16.